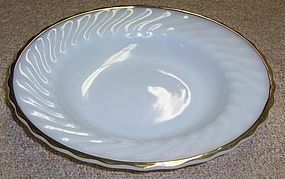 This really nice Golden Shell, Anchor White, Fire King 8 1/2 inch diameter Rim Soup Bowl was made by Anchor Hocking. This Soup Bowl measures 1 1/4 inches high and is in very good condition with no chips, cracks or scratches. The gold trim is really good. The Bowl is signed Anchor Hocking OVER PROOF - 12 - 2366 MADE IN USA. Be sure to search our other Fire King available. We guarantee all items to be as described. Feel free to email any questions. THANK YOU.